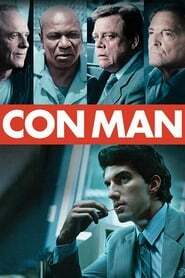 Con Man” is based on the true-life story of carpet cleaning ripoff artist Barry Minkow, whose ZZZZ Best Corporation managed to float a stock market IPO before Barry got busted for cooking the numbers that supported the almost non-existent company’s stock price. He went to prison, found Jesus and became a minister at the San Diego Community Bible Church. Barry shepherded his flock (which, being located in San Diego, certainly included a few military members, veterans or their families), started a fraud detection company and seemed to have turned his life around. He was profiled on “60 Minutes” and raised money from his parishioners to make a movie about his life, one that could lead sinners to a life of faith. If Barry Minkow could find redemption, the Lord can save anyone. Of course, Barry insisted that he play the middle-aged version of himself (Justin Baldwin, who came to fame on “Jane the Virgin” after he made the movie but long before it was released, plays young Barry). Just as the producers were starting to screen their cut of the movie, Minkow was arrested again and charged with ripping off his congregation for more than $3 million.